The magic of the interior of the Church of the Holy Trinity is created by the large stained glass windows. They are translucent walls letting in daylight through multicolored filters, and accenting the verticals, a sense of soaring height is attained. There are 17 stained glass windows in the church, all memorials to various members of the Rhinelander family. Henry Holiday in England designed them, and he made them all except the west window which after his death was completed by his daughter from his designs. These windows are the only complete cycle of windows remaining by Henry Holiday, and Holy Trinity is one of the few churches in the world in which all the windows were designed by one man. Stained glass is a misnomer; the windows are more the result of a process than a glass per se. They are produced by painting upon either clear or colored glass with metallic pigments which penetrate the glass when subjected to heat. The pieces of glass are then inserted into grooves in lead. When the church was consecrated, only the 7 chancel windows, each representing two events in the life of Christ, were in place. Now in the church there is one decorative window, which connects to the Tower Room and is colored glass. Similar decorative designs had originally filled all the nave windows until they were replaced. Installed next were the monumental transept windows, illustrating the crucifixion and ascension of Christ. The remaining nave windows (13 feet by 7 feet 6 inches) and the west window (at 15 feet by 24 (20?) feet) were donated by Rhinelander family members over the next 29 years. Like a carpet or an embroidery stained glass windows appeal first of all as pattern, and only subsequently as narrative. Holiday loved beautifully rendered details, full-fleshed studies of the human figure, opulent costumes and dramatic situations. With these attributes, Holiday's narratives vividly give us a tour of the Bible. In addition to the primary windows, there are also clerestory windows, high up, located on the wall, but above an adjacent roof. There are 15 clerestory windows, each measuring 13 feet by 7 feet 6 inches. In the nave, the clerestory windows on the south side of the church illustrate Old Testament figures and on the north side, the clerestory windows show figures from the New Testament. 20 feet by 15 with a stony arch-like frame, the west window has 15 panels divided into three rows of five columns each. The bottom row are representations of our earthly life and the middle row life in heaven or paradise. On the bottom row, from left to right, the first panel represents philosophy and poetry with a man holding a piece of parchment and the woman standing by his side and holding a stringed instrument. The next panel is science and agriculture portrayed by a man holding a telescope and a man and woman grasping firmly some agrarian implements. The central panel is the church and government represented by a man in ecclesiastical garb and a king and queen. The fourth panel symbolizes art and industry with an artist sitting with his brush and painting board; industry is shown by a woman holding some flax and a man clasping a hammer and some steel. The last panel is of music and mathematicsóa young woman is playing a violin while at her side sits a young man with ruffled brow and in his hands a long paper covered with geometrical figures. The middle row pictures men, women and children strolling happily in a sort of Garden of Eden. The top row of panels shows Jesus sitting, clothed in the robes of a ruling king, and holding the orb, the symbol of power. His angelic helpers stand on either side of the throne. The highest part of the window, in the shape of a large four-leaf clover, has four small rosette windows each picturing a knight clad in armor. This window is a geometric design rather than a traditional narrative stained glass window. Behind this window is the bell tower. Since light will never shine through this window a more detailed design would not be visible. Lydia, Early Church businesswoman dealing in purple dye. Mark, a cousin of Barnabas, grew up in Jerusalem and may have witnessed some events in Jesus' life. He accompanied Paul and Barnabas on the first missionary journey to Antioch, and according to tradition, Mark was Paul's interpreter in Rome, founded a church in Alexandria and became its first bishop. The actual authorship of the Book of Mark remains an enigma, but it is thought to be the earliest book and a source for both Matthew and Luke. Lydia - Shown in the center panel, Lydia was one of Paul's first converts and inscribed above her "the person whose heart the Lord opened." Acts 16:14-15 The Lord opened her heart to give heed to what was said by Paul. And when she was baptized, with her household, she besought us, saying, 'If you have judged me to be faithful to the Lord, come to my house and stay.' And she prevailed upon us. Barnabas - The inscription reads "Son of Consolation." Barnabas was an early convert to Christianity when Acts 4:32 Now the company of those who believed were of one heart and soul, and no one said that any of the things which he possessed was his own, but they had everything in common. Acts 4:36 Thus Joseph who was surnamed by the apostles Barnabas (which means, Son of encouragement), a Levite, a native of Cyprus, sold a field which belonged to him, and brought the money and laid it at the apostles' feet. Encouragement may mean consolation or exhortation. Barnabas later accompanied Paul and then Mark in the early spread of the Christian gospel. Peter is portrayed holding a book representing the fact that I and II Peter are attributed to him and a bunch of keys dangling from his hand, the symbol of Peter. Matthew 16:19: "I will give you the keys of the kingdom of heaven, and whatever you bind on earth shall be bound in heaven, and whatever you loose on earth shall be loosed in heaven." The rosette window over Peter's head bears the inscription, "Casting all your care on him" from I Peter 6-7. "Humble yourselves therefore under the mighty hand of God, that in due time he may exalt you. Cast all your anxieties on him, for he cares about you." James -James, one of the first apostles, is shown in the garb of a penniless follower of Jesus, as the inscription implies "They forsook all and followed him" Luke 5:11. James was killed by King Herod. John - The brother of James, and the disciple whom Jesus especially loved and to whom he entrusted his mother when he was being crucified. The book is a symbol that John was considered the author of the Gospel according to St. John. The inscription reads 'Beloved, let us love one another.' Peter, James and John were the inner circle of disciples. They were the disciples with Jesus at the Transfiguration and at Gethsemane. Saint Paul - Paul before he was converted on the Road to Damascus was called Saul; he was a zealous Jew and he persecuted Christians. He is portrayed holding in one hand a book representing his Epistles in the New Testament and in the other hand a sword as a symbol of the power and zeal of his missionary work. The inscription reads "The greatest of these is Charity." [Charity also means love.] I Corinthians 13:13 So faith, hope, love abide, these three; but the greatest of these is love. Phebe - Known as the first deaconess of the church, she is shown holding a bowl of fruit, signifying her work as a deaconess. Her inscription reads, "She has been a succourer of many." Phebe is mentioned by Paul in Romans 16:1-2 I commend to you our sister Phebe, a deaconess of the church at Cenchreae, that you may receive her in the Lord as befits the saints, and help her in whatever she may require from you, for she has been a helper of many and of myself as well. Phebe was a woman of means and in the early church a deacon and deaconess were the people who helped, particularly with providing food for widows, so that others could concentrate on preaching. They were probably recognized as leaders, though not yet as clergy. Phebe may well have taken Paulís letter to the Romans from Corinth to Rome. Stephen - Saint Stephen was one of the first deacons and the first martyr of the Church. He is shown with a stone in one hand and a book in the other. They represent his martyrdom and his sermon. The inscription reads "Lord, lay not this sin to their charge." "Some from the synagogue instigated others against Stephen by saying 'We have heard him speak blasphemous words against Moses and God.'" Acts 6:11. Rather than defend himself, Stephen recounted Israel's history focusing on Abraham, Joseph and Moses. Acts 6:59-60: "And as they were stoning Stephen, he prayed, 'Lord Jesus, receive my spirit.' And he knelt down and cried with a loud voice, 'Lord, do not hold this sin against them.' And when he had said this he fell asleep. And Saul was consenting to his death." In the main panels of the window, the figure of Christ is shown being received into Heaven by a host of angels. At the base of the picture are Christís 11 disciples with halos around their heads and other faithful followers. In the tracery above the main window there is a small rosette window showing a woman praying. Directly above this is a small circular window containing a cross and the letters "XP", the abbreviation of the Greek word for Christ, and "AO" or Alpha-Omega, the first and last letters of the Greek alphabet. In the last book of the Bible, The Revelation to John 1:8 "I am the Alpha and the Omega, says the Lord God, who is and who was and who is to come, the Almighty." To the left and right there are two more small rosette windows each showing two men holding books symbolizing the four Gospels and around the men are ribbons containing the first words of each Gospel. In the left rosette window are the words "The book of the generation of Jesus Christ" for Matthew's Gospel and "The beginning of the gospel of Jesus Christ" for Mark's Gospel. The window on the right has the inscriptions "For as much as many have taken in hand", the first words of the Gospel according to St. Luke, and "In the beginning was the word", the opening words of the Gospel according to St. John. The Lower Panel depicts the Nativity of Jesus Mary is holding the infant Jesus; shepherds are on the left and the Three Wise Men on the right are presenting their gifts of gold, frankincense and myrrh. "Peace of Earth" is the message told by the 2 cherubs at the base of the picture. Luke 2:13-14: "And suddenly there was with the angel a multitude of the heavenly host, praising God and saying, "Glory to God in the highest heaven, and on earth peace among men with whom he is pleased!" The Upper Panel: is the Presentation of Jesus in the Temple: Mary and Joseph are shown offering Jesus to the chief priests of the Temple. Luke 2:22: "And when the time came for their purification according to the law of Moses, they brought him up to Jerusalem to present him to the Lord." The Lower Panel shows Jesus with the Elders in the Temple in Jerusalem. When he was 12 years old, Jesus and his parents went to Jerusalem for the festival of Passover. Unbeknownst to his parents, he stayed behind when they left. Luke 2:46: "After 3 days they found him in the temple, sitting among the teachers, listening to them and asking them questions;. and all who heard him were amazed at his understanding and his answers. And when they saw him they were astonished; and his mother said to him, 'Son, why have you treated us so? Behold, your father and I have been looking for you anxiously.' And he said to them, 'How is it that you sought me? Did you not know that I must be in my Father's house?'" The Upper Panel is the Baptism of Jesus: Jesus the central figure is seen arising from the water, while a dove, the symbol of the spirit of God, is shown descending on him. On the left is John the Baptist clothed with camel's hair and on the right 2 angels. Matthew 3:16-17: "And when Jesus was baptized, he went up immediately from the water, and behold the heavens were opened and he saw the Spirit of God descending like a dove, and alighting on him; and lo, a voice from heaven, saying, 'This is my beloved Son, with whom I am well pleased.'" In the small window above the main window are the words "Love" and "Joy"
9. Calling of the First Disciples and the Wedding feast in Cana. The Lower Panel portrays the Calling of the First Disciples: On the shore with Jesus are Andrew and his brother Peter; in the boat with their fishing nets are James and John and their father, distinguished from the others by his lack of a halo. Matthew 4:18-22 (also Mark 1:16-20) : "As he walked by the Sea of Galilee, he saw two brothers, Simon who is called Peter and Andrew his brother, casting a net into the sea; for they were fishermen. And he said to them, 'Follow me, and I will make you fishers of men.' Immediately they left their nets and followed him. And going on from there, he saw two other brothers, James the son of Zebedee and John his brother, in the boat with Zebedee their father, mending their nets, and he called them. Immediately they left the boat and their father, and followed him." The Upper Portion pictures the Wedding Feast in Cana. At the Wedding Feast in Cana the wine ran out and Jesus said to the servants (John 2:7) "Fill the jars with water." And they filled them up to the brim. He said to them, "Now draw some out, and take it to the steward of the feast." So they took it. When the steward of the feast tasted the water now become wine, and did not know where it came from (though the servants who had drawn the water knew), the steward of the feast called the bridegroom and said to him, "Every man serves the good wine first; and when men have drunk freely, then the poor wine; but you have kept the good wine until now." This, the first of his signs, Jesus did at Cana in Galilee, and manifested his glory; and his disciples believed in him. 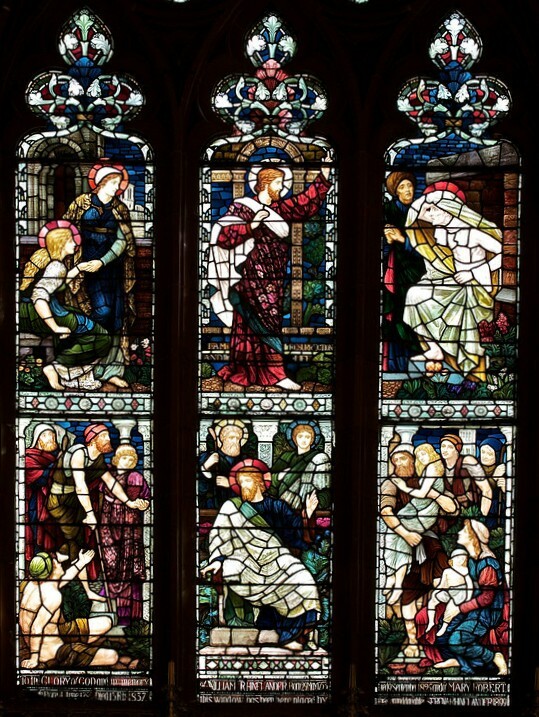 In the rosette window above: "Peace" and "Longsuffering"
The Lower Panel shows The Healing of Bartimaeus - Jesus is shown in a crowd of sick people gathering around him and in the lower left corner is the blind beggar Bartimaeus. Luke 18:36-43 and hearing a multitude going by, he inquired what this meant. They told him, "Jesus of Nazareth is passing by." And he cried, "Jesus, Son of David, have mercy on me!" Those who were in front rebuked him to be silent; but he cried out all the more, "Son of David, have mercy on me!" And Jesus stopped, and commanded him to be brought to him; and when he came near, he asked him, "What do you want me to do for you?" He said, "Lord, let me receive my sight." And Jesus said to him, "Receive your sight; your faith has made you well." And immediately he received his sight and followed him, glorifying God; and all the people, when they saw it, gave praise to God. The upper panel tells the story of the raising of Lazarus who had been dead for 4 days before Jesus arrived. The body of Lazarus is seen coming out of the grave at the request of Jesus, while Mary and Martha, the sisters of Lazarus, look on in amazement. John 11:40: "Jesus said to her, 'Did I not tell you that if you would believe you would see the glory of God?' So they took away the stone. And Jesus lifted up his eyes and said, 'Father, I thank thee that thou hast heard me. I knew that thou hearest me always, but I have said this on account of the people standing by, that they may believe that thou didst send me.' When he had said this, he cried with a loud voice, 'Lazarus come out.' The dead man came out, his hands and feet bound with bandages, and his face wrapped with a cloth. Jesus said to them, 'Unbind him, and let him go.'" The Lower Section portrays the Sermon on the Mount Jesus is shown seated on a rock preaching the Beatitudes. Matthew 5:3-6 Blessed are the poor in spirit, for theirs is the kingdom of heaven. Blessed are those who mourn, for they will be comforted. Blessed are the meek, for they shall inherit the earth. Blessed are those who hunger and thirst for righteousness, for they shall be satisfied. The Upper Panel depicts the Triumphal Entry into Jerusalem Jesus is shown riding a donkey into Jerusalem. Mark 11:8-10 And many spread their garments on the road, and others spread leafy branches which they had cut from the fields. And those who went before and those who followed cried out, "Hosanna! Blessed is he who comes in the name of the Lord! Blessed is the kingdom of our father David that is coming! Hosanna in the highest!" Above in the small rosette windows are the words "Gentleness" and "faith"
Matthew 26:26-29: "While they were eating, Jesus took a loaf of bread, and after blessing it he broke it, gave it to the disciples, and said, 'Take, eat; this is my body.' Then he took a cup, and after giving thanks he gave it to them, saying, 'Drink from it, all of you; for this is my blood of the covenant, which is poured out for many for the forgiveness of sins.'" The Upper Half depicts the Trial before Pilate. On the left is Pilate sitting on the judgment seat, while Jesus, held by soldiers, is facing him. Mark 15:2-5 Pilate asked him, "Are you the king of the Jews?" And he answered him, "You have said so." And the chief priests accused him of many things. And Pilate again asked him, "Have you no answer to make? See how many charges they bring against you." But Jesus made no further answer, so that Pilate wondered. In the background can be seen the other prisoner, Barabbas, whom the people chose to be set free in place of Jesus. Matthew 27:21 "The governor again said to them, 'Which of the two do you want me to release for you?' And they said, "Barabbas." In the small windows above are the words "Meekness" and "Temperance". The Lower Panel shows the Mocking of Jesus. Jesus is dressed in a purple robe, with a reed in his hand, and a crown of thorns on his head, standing in the Praetorium Hall being mocked by a crown of spectators. Matthew 27:28-31: "And they stripped him and put a scarlet robe upon him, and plaiting a crown of thorns they put it on his head and put a reed in his right hand. And kneeling before him they mocked him, saying, 'Hail, King of the Jews!' And they spat upon him, and took the reed and struck him on the head." The Upper Panel depicts Jesus on the road leading to Calvary. Simon of Cyrene is shown being forced to carry the cross for Jesus. Luke 23:26: "And as they led him away, they seized one Simon of Cyrene, who was coming from the country, and laid on him the cross to carry it behind Jesus." In the center of the picture Jesus can be seen looking backward toward his mother and Mary Magdalene who had come out on the road to bid Jesus their last farewell. Luke 27: "And there followed him a great multitude of the people, and of women who bewailed and lamented him." Above the main portion of the window is a ribbon bearing the words, "He was wounded for our transgressions." Isaiah 53:5: "But he was wounded for our transgressions, he was bruised for our iniquities; upon him was the chastisement that made us whole, and with his stripes we are healed. All we like sheep have gone astray; we have turned every one to his own way; and the Lord has laid on him the iniquity of us all." In the main panel Jesus is seen fixed to the cross with the two thieves who were crucified with him on either side. On the left side Mary Magdalene, Mary, the mother of Jesus and Solome, the mother of James and John. In the lower right hand of the picture a group of Roman soldiers are shown casting lots for the garments of Christ. John 19:23: "When the soldiers had crucified Jesus they took his garments and made four parts, one for each soldier; also his tunic. But the tunic was without seam, woven from top to Bottom; so they said to one another, 'Let us not tear it, but cast lots for it to see whose it shall be.' This was to fulfill the scripture, 'They parted my garments among them, and for my clothing they cast lots.'" The whole scene is surmounted by a host of angels praying and waiting to receive the soul of the crucified Christ. In the tracery above the main portion of the window, there is a small window containing the symbol XP, the abbreviation of Christís name in Greek. There are also four small cloverleaf windows which continue the story after the crucifixion. From the left to the right they portray Christ being taken down from the cross; Christ being placed in the he tomb; a soldier standing guard; and finally, Martha and Mary bringing spices for Christ's body. Matthew 27:57: "When it was evening, there came a rich man from Arimathea, named Joseph, who was also a disciple of Jesus. He went to Pilate and asked for the body of Jesus; then Pilate ordered it to be given to him. So Joseph took the body and wrapped it in a lean linen cloth and laid it in his own new tomb, which he had hewn in the rock." Matthew 27:65: "Pilate said to them, 'You have a guard of soldiers; go, make it as secure as you can.' So they went with the guard and made the tomb secure by sealing the stone." Mark 16:1: "When the Sabbath was over, Mary Magdalene and Mary the mother of James, and Salome bought spices, so they might go and anoint him. And very early on the first day of the week, when the sun had risen, they went to the tomb." The prophet Elijah is shown calling on God to set fire to a sacrifice drenched with water. In I Kings 18 the prophets of Baal and the prophet Elijah each prepared a bull for sacrifice and lay it on wood; and Elijah, as the inscription reads, said "the God who answereth by fire, let him be God." In the window fire is falling. I Kings 18:24: "The prophets of Baal called on the name of Baal from morning until noon, saying, 'O Baal, answer us!' But there was no voice, and no one answered." I Kings 18:26: "Elijah then said, Answer me, O Lord, answer me, that this people may know that thou, O Lord, art God, and that thou hast turned their hearts back. Then the fire of the Lord fell, and consumed the burnt offering, and the wood, and the stones, and the dust, and licked up the water that was in the trench." I Kings 18:37-38: "Esther was married to King Ahasuerus who did not know she was Jewish. He had been persuaded by Haman to decree that the Jews be massacred because 'their laws are different from those of every other people, and they do not keep the king's laws.' Esther 3:8. The inscription reads "Let my people be given at my request." King Ahasuerus asked Esther, "What is your petition, Queen Esther? It shall be granted you. And what is your request? Even to the half of my kingdom, it shall be fulfilled." Then Queen Esther answered, "If I have found favor in your sight, O king, and if it please the king, let my life be given me at my petition, and my people at my request." Esther 7:2-3. 16. David, Saul and Samuel. Samuel is portrayed holding a law book and the inscription states "I will teach thee the good and the right way." I Samuel 12:23: "Samuel was the last judge over Israel; when he was old, the people of Israel wanted a king. Samuel anointed Saul the first king over Israel," and I Samuel 10:25: "Then Samuel told the people the rights and duties of the kingship; and he wrote them in a book and laid it up before the Lord. "Saul, a tall and earnest young man capable of leading Israel on the battlefield, is shown in full military raiment and the inscription above him reads: "The Lord hath wrought salvation in Israel." I Samuel 11:13: "Having proven himself in battle, Saul's life began to unravel. He was condemned for failing to obey the prophetically mediated divine word of God and became an increasingly jealous and often irrational old king in conflict with young David to whom the Lord had promised his throne." David followed Saul as king of Israel. Handsome, charismatic and endowed with extraordinary skills as a musician and soldier, David was consistently successful in everything because "The Lord is with him." The lion at his feet signifies that he was favored in the eyes of God and his skill as a musician is shown in the musical instrument he is carrying and the inscription above him reads, "Upon the harp will I praise Thee, O God." The Davidic covenant established that his descendants would rule in an unending dynasty in Jerusalem. Abraham is shown holding a knife and the inscription in the small window reads "By faith, when Abraham was tried, he offered up Isaac" (Hebrews 11:17). Genesis 22:1-2 After these things God Tested Abraham, and said to him, "Abraham!" And he said, "Here am I." He said, "Take your son, your only son Isaac, whom you love, and go to the land of Moriah, and offer him there as a burnt offering upon one of the mountains of which I shall tell you." Genesis 22:10-13 Then Abraham put forth his hand, and took the knife to slay his son. But the angel of the Lord called to him from heaven, and said, ëAbraham, Abraham!í And he said, "Here as I". He said, "Do not lay your hand on the lad or do anything to him; for now I know that you fear God, seeing you have not withheld your son, your only son, from me." And Abraham lifted up his eyes and looked, and behold, behind him was a ram, caught in a thicket by his horns; and Abraham went and took the ram, and offered it up as a burnt offering instead of his son. The center panel shows Joseph, Abraham's great grandson, who was sold into slavery by his brothers. He was taken to Egypt where because he was able to interpret Pharaohís dreams, he was appointed ruler of Egypt. The window shows Joseph wearing the robes of an Egyptian ruler and the inscription over him says "Pharaoh said to Joseph, I have set thee over all Egypt." Genesis 41:41. Joseph saved Egypt from a famine and Egypt became a haven for people escaping famine. At Josephís request, his father Jacob and his family moved to Egypt to survive a drought. They grew into the nation of Israel living in Egypt 430 years until the exodus. Moses is shown with his face bowed down and the inscription reads "Moses hid his face for he was afraid to look at God." Exodus 3:2-6 And the angel of the Lord appeared to him in a flame of fire out of the midst of a bush; and he looked, and lo, the bush was burning, yet it was not consumed. And Moses said, "I will turn aside and see this great sight, why the bush is not burnt." When the Lord saw that he turned aside to see, God called to him out of the bush, "Moses, Moses!" And he said, "Here am I". Then he said, "Do not come near; put off your shoes from your feet, for the place on which you are standing is holy ground." And he said, "I am the God of your father, the God of Abraham, the God of Isaac, and the God of Jacob." And Moses hid his face, for he was afraid to look at God. Tubal Cain is shown at his work bench with his tools making a brass jar and in the rosette window above his head the inscription says "an instructor of artifices in brass and iron". Genesis 4:22 Zillah bore Tubal Cain; he was the forger of all instruments of bronze and iron. Enoch is depicted being lifted directly from earth to heaven. The inscription above him reads "He was not for God took him." (Genesis 5:24) The atypical wording suggests something other than death. Genesis 5:25 Enoch walked with God; and he was not, for God took him. Hebrews 11:5 By faith Enoch was taken up so that he should not see death; and he was not found, because God had taken him. Now before he was taken he was attested as having pleased God. Genesis 6:6-8 And the Lord was sorry that he had made man on the earth, and it grieved him to his heart. So the Lord said, ìI will blot out man whom I have created from the face of the ground, man and beast and creeping things and birds of the air, for I am sorry that I have made them.î But Noah found favor in the eyes of the Lord. Genesis 9 for Christ, and "AO" or Alpha-Omega, the first and last letters of the Greek alphabet. In the last book of the Bible, The Revelation to John 1:8 "I am the Alpha and the Omega, says the Lord God, who is and who was and who is to come, the Almighty." To the left and right there are two more small rosette windows each showing two men holding books symbolizing the four Gospels and around the men are ribbons containing the first words of each Gospel. In the left rosette window are the words "The book of the generation of Jesus Christ" for Matthewís Gospel and "The beginning of the gospel of Jesus Christ" for Mark's Gospel. The window on the right has the inscriptions "For as much as many have taken in hand", the first words of the Gospel according to St. Luke, and "In the beginning was the word", the opening words of the Gospel according to St. John.